Show your support for small business and become a fan of ABC on Facebook - help spread the word -- small businesses are here to stay. 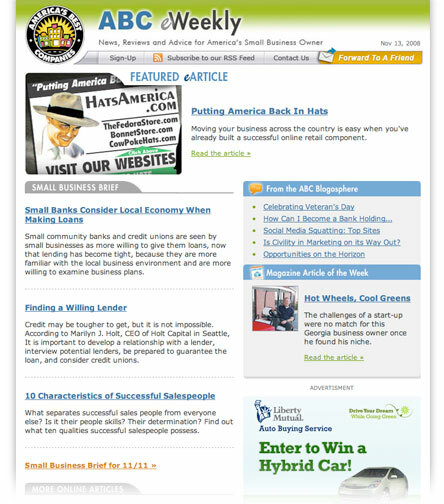 Check out our 'boxes' to stay up-to-date with America's Best magazine and all of our small business blog feeds. Share your ideas, thoughts and questions by posting a comment on the ABC wall. I am new to the abc team and very excited about being part of a company that is the face of small business and is run by people that have this company headed in the right direction so as team members thats all be a part of bringing the small businesses back to america and educate them how to be sucessful and how to stay at the top god bless all of you.